Impact Soundworks’ Momentum – what is it? 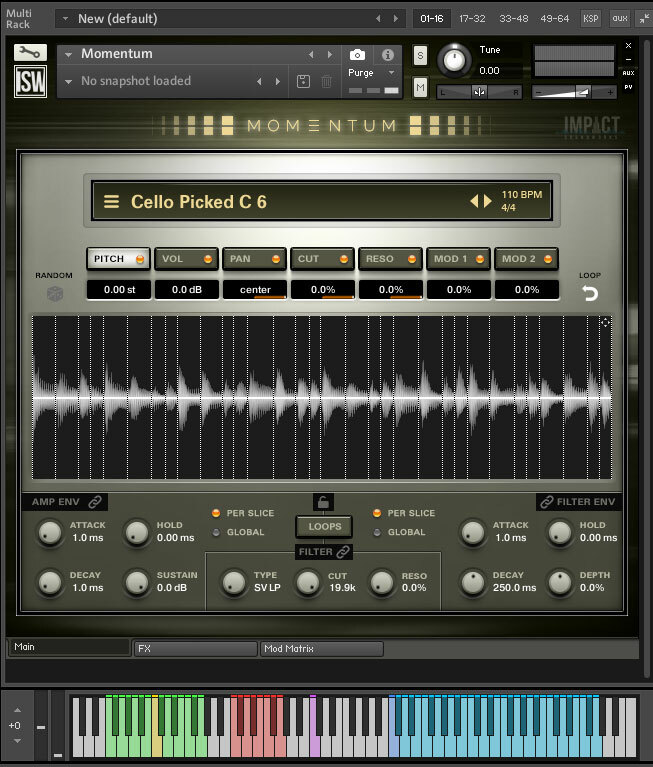 Momentum is a collection of over 2,500 original organic percussive performances, mostly arranged into sliced loops but with some single shots, too. There are two versions of the software. 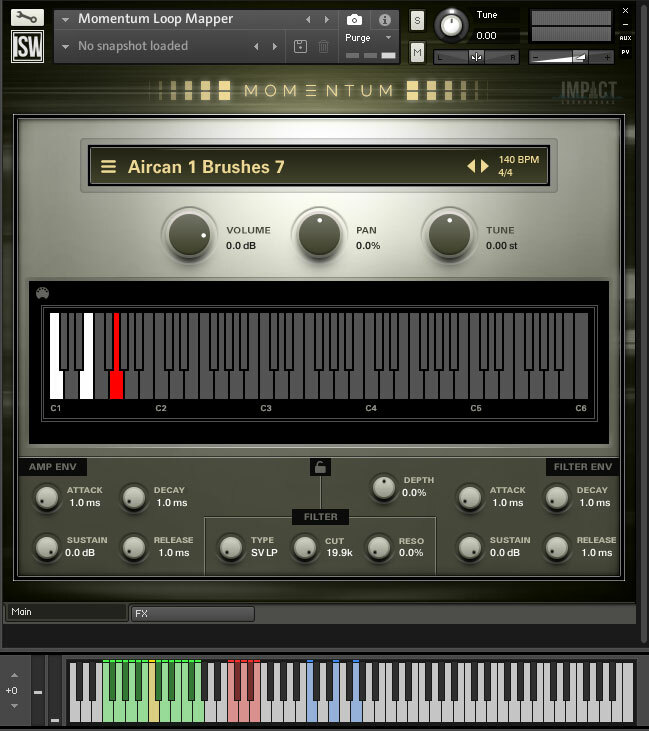 One runs in the full version of Native Instruments’ Kontakt versions 5.5.2 or higher, although not the free Kontakt Player, and the second is a REX and Wav file collection. You can download either or both. Each requires 8Gb of disk space. Around 160 ‘instruments’ were recorded to create the collection. They include dozens of drums and pitched instruments, hit with various objects, plus many items you may not think have drum potential such as a napkin holder, PC keyboard, soup pot, an ironing board, and bike spokes. The main instrument, or Loop Designer, gives you access to dozens of rhythmic loops with a multitude of options to change, morph and process them in a vast number of ways. The main screen shows the current loop and the slices it is divided into. The Kontakt keyboard is colour-coded, offering quick access to various functions and if you run the software in Native Instruments’ Komplete Kontrol, the lights on an S-series keyboard duplicate the colours. This is extremely useful as it shows the control keys and where the keymaps start and end. The number of keys which trigger the loop vary according to the number of slices in the loop. The lowest key starts the loop at the first slice and subsequent keys start the loop at subsequent slices allowing you to experiment with different patterns. Another three keys produce a 16th-, 32nd- and 64th-note stutter effect while the final three produce a gate/chop effect with the same note intervals. Some instruments have oneshot hits associated with them and another set of keys (purple) triggers these. Below the loop name and above the slices are a set of controls for modulating the slices. 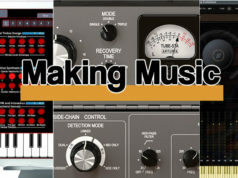 These include Pitch, Volume, Pan, Filter and Modulation controls. To edit a slice, you select the function then drag up and down with the mouse within the slice. 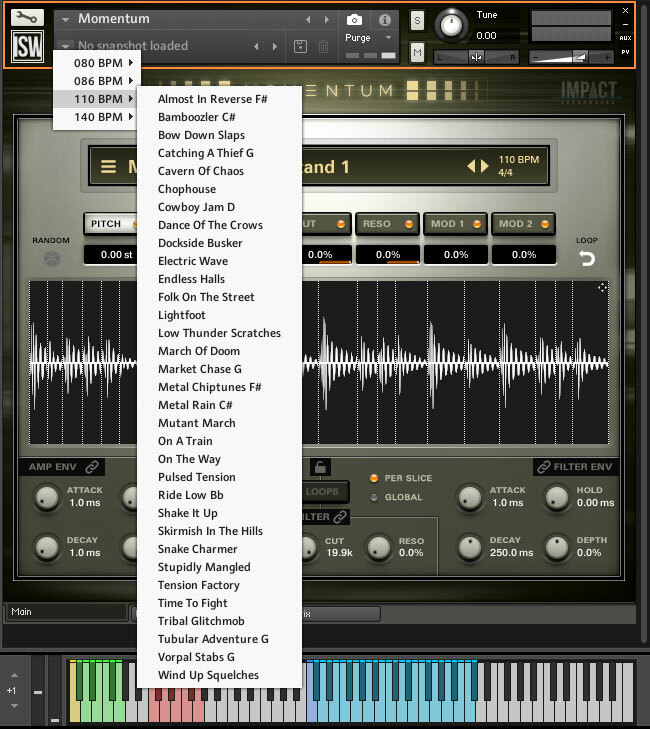 These functions can radically change the sound of a loop, and in case you’re stuck for inspiration, a Random button randomises the settings of the currently-selection function. You can disable the edits you – or the randomiser – has made to each function so you can see which of the edits sound best together. Many of the functions have a Learn MIDI CC (Continuous Controller) option so you can fiddle with them in real-time. Below the slice window is a set of controls for adjusting the Amplitude and the Filter. These can be applied on a global or per-slice basis. When you find a loop you like you can drag the loop’s MIDI slice data into your DAW. You can use this data to trigger slices, of course, but also to trigger other instruments, say a synth or a bass sound, which would map perfectly to the loop’s rhythm. The left and right arrows to the right of the loop name cycle through the loops. To the right of the arrows is the loop’s BPM and time signature. Kontakt adjusts the loop’s BPM to your DAW’s tempo. To retain the essence of the loop it’s a good idea to select a working tempo which is reasonably close to the loop’s BPM – but who knows what might result if you ignore that advice! A browser helps select different types of loop more scientifically. It has four filter types – Time Signature, Frequency, Pitch and Timbre. These should be self-explanatory. You can only select one Time Signature (no polyrhythms here) but, interestingly, you can select both Pitched and Unpitched at the same time which, of course, has no results. It is, however, interesting to try various combinations of Timbres as many loops contain moiré than one type. A useful Auto Preview function plays the loop when you click on the name which saves a lot of faffing about on the keyboard. But that’s not all. 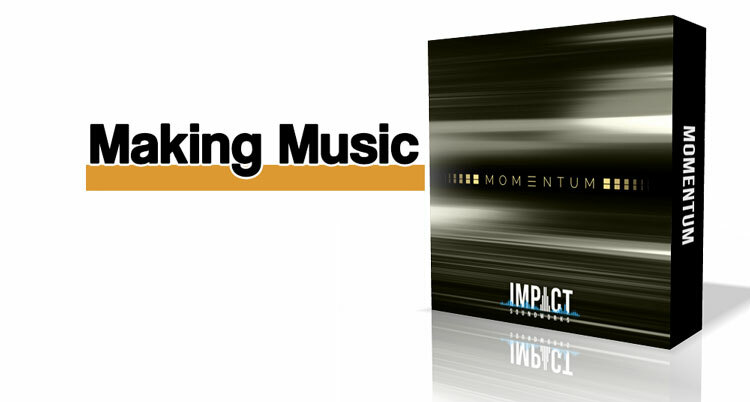 Momentum includes a serious set of effects. 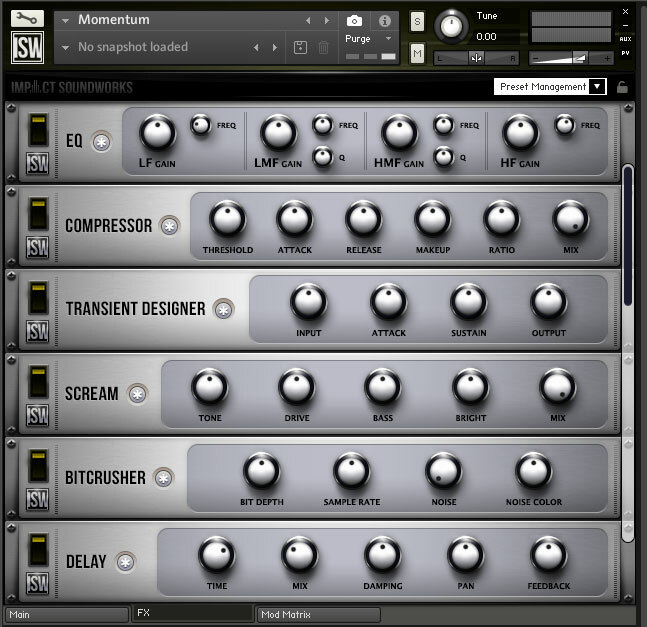 These include: EQ, Compressor, Transient Designer, Scream, Bitcrusher, Delay, Reverb, and Limiter. A couple of explanations: the Screamer is a distortion unit based on the Tube Screamer guitar pedal, and the Bitcrusher reduces the bit depth and sampling rate, producing a grungy, gritty sound. The Reverb module has a set of custom convolution impulses. These can have a dramatic effect (sorry!) on the sound and each unit has a Random button which you’ll spend half your time in the FX rack hitting to see what happens. A Preset Management menu lets you quickly reset the rack and load and save previous rack settings so you can save those you really like. And if you’re thinking there can’t be much more you’d be wrong. 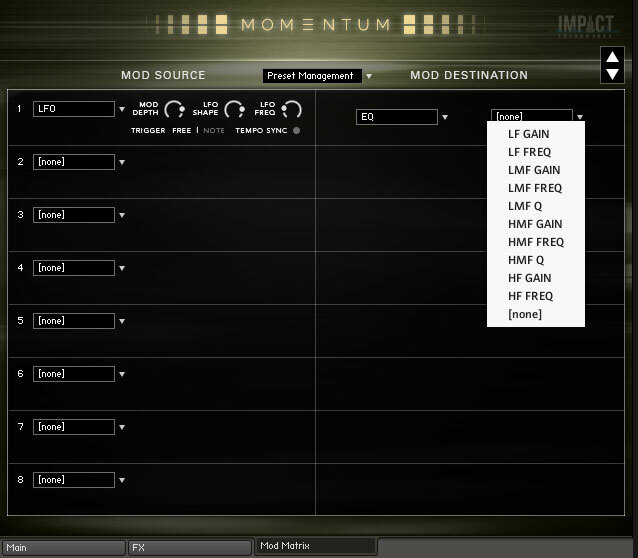 The Mod Matrix lets you modulate virtually any of the FX Rack’s controls with a number of modulators. For example, if you select LFO as a modulation source, a mini set of LFO controls appears. You can route this to one of seven Rack FX (the Limiter is not included) and then select which parameter you want to modulate. If you’re easily pleased – guess who did this? – you can then switch to the FX Rack and watch the controls being automated in real time. 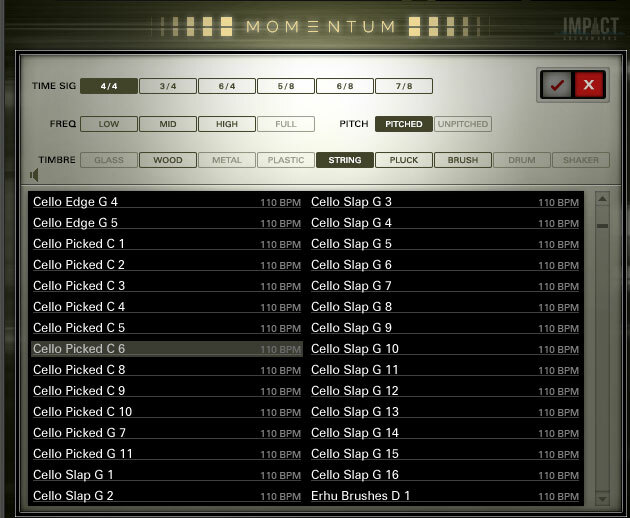 To give you an idea of what customisation can do, Momentum comes with 72 Snapshots arranged into four sections with different BPM. These open up a whole new level of possibilities as you see how the original loops have been used to create something often radically different. In addition to the Loop Designer, there’s also a Loop Mapper instrument. As its name suggests, this allows you to map individual loops to keys across the keyboard. Each key can have its own volume, pan and tune settings and you can map the same loop to different keys, each with different settings. The instrument also has the Amplitude and Filter settings of the Loop Designer but you can only assign them to the entire loop, not individual slices. It also has the FX Rack but not the Mod Matrix. It has a similar Browser window with the addition of a Note Display which show which note is being edited, and you can change the note here, too, if you wish. If you’ve discovered several loops that you’d like to play in sequence, this is the way to do it. It’s also a good way to experiment to see which loops fit well together. You lose some of the nuances of the Loop Designer but if you really need to string together a sequence of highly-customised loops, you can do it in your DAW. There are 37 oneshot instruments which load like a normal Kontakt instrument. 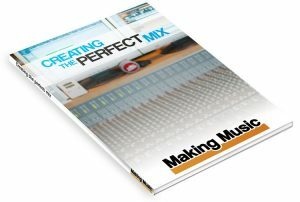 They have the Envelope and Filter controls and also the FX Rack. A couple of the instruments contain oneshots of all unpitched samples spread across the keyboard so you can play all the individual sounds. The other oneshots are pitched samples and you can play them across the range of the keyboard. 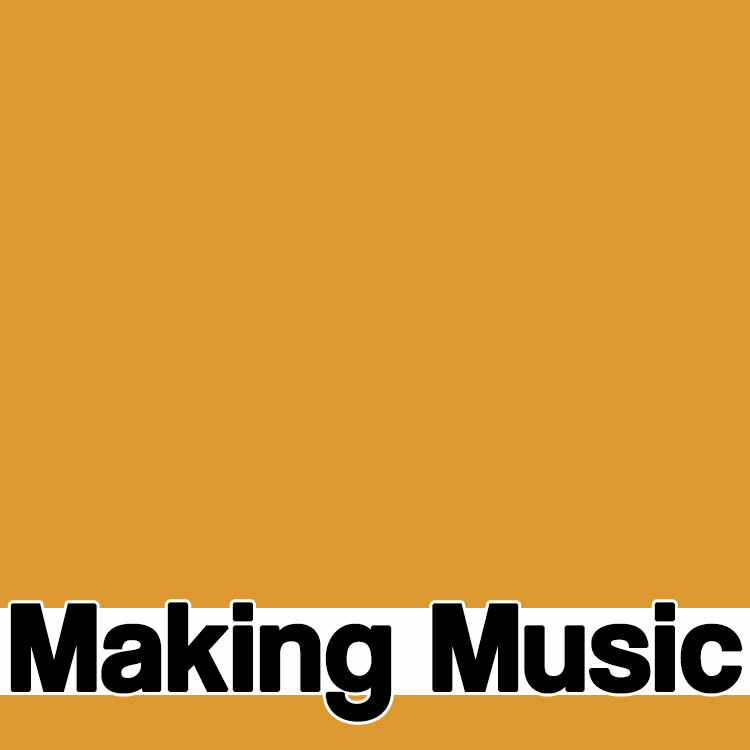 These include several instrument samples that you can actually play as a, er, instrument. These include bouzoukis, cellos, guitars and violins, as well as samples you may not think of as instruments such as brass urns. 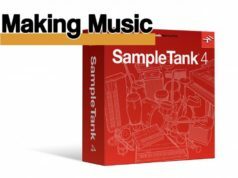 These are a wonderful bonus and you can create some very beautiful and melodic instruments simply by adding a touch of reverb and delay. The sounds and patterns you can generate with Momentum vary from epic trailer hits and patterns all the way through to EDM tracks. Part of the attraction of the package is the range and variety of the patterns. If you find one which is close but not exactly right for a project, you can tweak it in innumerable ways to get what you want. The other attraction is the actual samples. Unless someone else is using Momentum, no one else will have the same sounds. Plus, they are organic which, for many types of music, lifts them above the level of highly quantised, processed sounds. Of course, given the wealth of manipulation features, you can apply serious processing to the loops, too, just as you wish. If you’re using REX and Wav files you can manipulate them even more. The oneshots are a great bonus, particularly the pitched sounds. If you use rhythmic patterns in your music, and need something more than a repetitive synth or arpeggiated bass line, it’s difficult to see how your music would not benefit from a touch of Momentum.